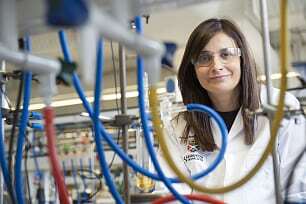 Originally from Gijon (Spain), Eva Hevia is currently a Professor in Inorganic Chemistry at the University of Strathclyde. Research in her group focuses on applying polar organometallic reagents incorporating cooperative effects to key organic transformations. Recently she had made important advances in both the activation of N-heterocyclic molecules and Green Chemistry, including the first applications of polar organometallics in Deep Eutectic Solvents (DESs) as well as developing new s-block-based metal catalysts. Eva received both her MSci degree in Chemistry and her Ph.D. degree from the Universidad de Oviedo (Spain) in 1998 and 2002 respectively. The latter was under the supervision of Professor Victor Riera and Dr Julio Perez. After a three-year position at the University of Strathclyde working as a Marie Curie Fellow with Professor Robert Mulvey, in 2006 she took up a Royal Society University Research Fellowship and Lectureship there. Subsequently she was promoted to Senior Lecturer in 2010, Reader in 2011 and to Professor in 2013. Eva has authored over 110 peer-reviewed papers to date and her research has been recognised with the RSC Harrison-Meldola Memorial Medal and Prize (2009) and the Sigma-Aldrich Emerging Investigators Award (2011) from the Spanish Royal Society of Chemistry (RSEQ). She was also awarded an ERC Starting Grant in 2011. A member of the RSE Young Academy of Scotland and the International Advisory Board of the European Journal of Inorganic Chemistry, Eva was the recipient of the inaugural edition of the SRUK Emerging Talent Award in 2016, which honours the most promising Spanish scientist researching in the UK under the age of 40. Magnesium-Mediated Benzothiazole Activation: a Room Temperature Cascade of C-H Deprotonation, C-C Coupling, Ring-Opening and Nucleophilic Addition Reactions. V. L. Blair, W. Clegg, A. R. Kennedy, Z. Livingstone, L. Russo, E. Hevia, Angew. Chem. Int. Ed. 2011, 50, 9857. Shedding New Light on ZnCl2-Mediated Addition Reactions of Grignard Reagents to Ketones: Structural Authentication of Key Intermediates and Diffusion-Ordered NMR Studies. D. R. Armstrong, W. Clegg, P. García-Alvarez, E. Hevia, M. D. McCall, L. Nuttall, A. R. Kennedy, L. Russo, Chem. Eur. J, 2011 17, 4470. Exposing the Hidden Complexity of Stoichiometric and Catalytic Metathesis Reactions by Elucidation of Mg-Zn Hybrids. J. Z. Chua, P. García-Álvarez, E. Hevia, A. R. Kennedy, M. D. McCall, PNAS, 2010, 107, 5294. Structural Basis for Regioisomerization in the Alkali-Metal-Mediated Zincation (AMMZn) of Trifluoromethyl Benzene by Isolation of Kinetic and Thermodynamic Intermediates. D. R. Armstrong,.V. L. Blair, W. Clegg, S. H. Dale, J. García-Alvarez, E. Hevia, G. W. Honeyman, R. E. Mulvey, L. Russo,J. Am. Chem. Soc. 2010, 132, 9480. Closer Insight into the Reactivity of TMP-dialkyl Zincates in Directed ortho-Zincation of Anisole: Experimental Evidence of Amido Basicity and Structural Elucidation of Key Reaction Intermediates.W. Clegg, B. Conway, E. Hevia, M. D. McCall, L. Russo, R. E. Mulvey, J. Am. Chem. Soc. 2009, 131, 2375. Eva Hevia's main research interest targets the design and application of polymetallic reagents which combine metals with distinct polarities and integrate them with different ligand sets into the one molecule. Cooperative effects between the metals enable the opening up of new and exciting areas of chemistry centred on metal-mediated organic synthesis and supramolecular structure building. Recent breakthroughs from EH's group include informative mechanistic studies codifying how these compounds operate in deprotonative metallation reactions as well as successfully applying novel Mg-Zn hybrid reagents in metal-halogen exchange and nucleophilic addition processes as well as using bimetallic composites to construct unique supramolecular scaffolds which are not accessible using more conventional monometallic systems. Panel Member of Ramon y Cajal Fellowship Scheme, 2013 (Spanish research Council). Panel Member of the Royal Society Newton International Fellowship Scheme, since 2012. Member of the Royal Society of Chemistry (RSC), American Chemical Society (ACS), the Sociedad Espanola de Quimica (RSEQ), and the Society of Spanish Researchers in the UK (SRUK). The AcademiaNet member is honoured for her contributions to the field of chemistry.